Veteran journalist Ma. Ceres Doyo admits that the $1,000 compensation awarded to her and each of the more than 7,000 martial law victims was small, considering the abuses they endured more than two decades ago during the Marcos regime. Just the same, the Philippine Daily Inquirer columnist still decided to treat herself, if only to reaffirm what she thought was a long delayed but much deserved justice for victims of Marcos’ crimes. 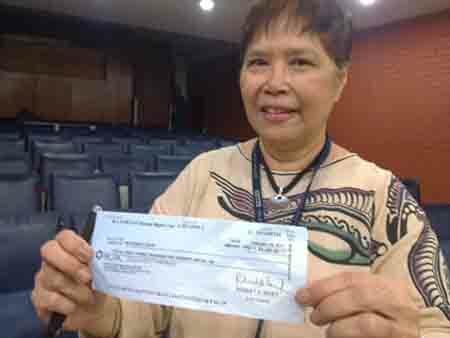 “I’m having a hearty lunch with a fellow claimant,” said a delighted Doyo, clutching her check after emerging from the Commission on Human Rights (CHR) office in Quezon City, where victims residing in Metro Manila can claim their checks until Friday. The CHR had also offered their regional offices to become venues where lawyers Robert Swift and Rod Domingo Jr. could accommodate the 7,526 claimants. Doyo said she had originally planned to just claim her check, cover the first day of distribution for her paper, then leave. But recognizing her as being a human rights victim, other journalists covering the distribution started swarming to her, with photojournalists asking her to pose for the camera while showing her check. “Nagku-cover lang ako. Ayan, ngayon ako na rin ang kino-cover (I came here to cover this, now I’m the one being covered),” she said in jest, before finally giving in to requests to be interviewed. Doyo, during the martial law, was a staff writer for the Philippine Panorama. She was invited for interrogation and placed under military custody before she was sent behind bars. Doyo told GMA News Online she considers the awarding of $1,000 to her and other martial law victims as “symbolic,” adding that she hopes the monetary compensation would not be the last of it. “Sana may susunod pa. Umaasa akong may susunod pa dito kasi malaki ang perang pinag-uusapan dito (I hope there’s more because I heard there’s a lot of money involved in this),” she said. In a ruling in 1995 by a US federal jury, the Marcos family were ordered to pay the victims $2 billion in damages, but up until this month, the victims never received a single centavo because the Marcos’ properties are still being disputed. In January, US District Court of Hawaii Judge Manuel Real awarded the $10 million that came from a settlement with owners of supposed Marcos properties in Texas and Colorado to 7,526 claimants. 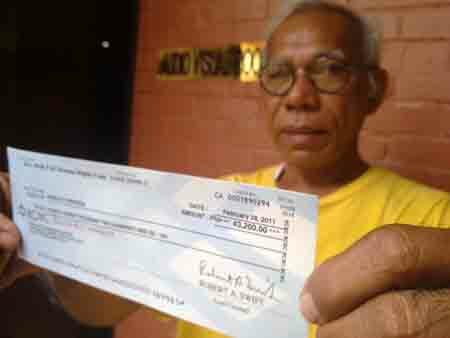 Shortly before Doyo arrived at the venue, Philippine Star columnist Jarius Bondoc, another martial law victim, also came to claim his check. Pat Roque, a photojournalist from the Associated Press who was also a martial law victim, also showed up at the CHR to take snapshots of the victims claiming their checks. “Ikaw, kailan ka magke-claim (When will you claim your check)?” Doyo beamed at Roque after noticing that he, too, was covering the event. Roque said he wouldn’t be getting his until Friday. For an orderly distribution, the claimants’ lawyers divided their clients alphabetically with those with surnames starting with A to E being the first to claim on Tuesday. Those with surnames beginning with F, G, H, I, and J can claim their checks on Wednesday. Thursday is reserved for those with surnames starting with K to O; and Friday for P to T. Those with surnames starting with U to Z can get theirs on March 7. Claimants to the Marcos properties in the United States originally numbered to more than 9,000, but as years went by without the court arriving at a decision, the number dwindled to just over 7,000 after others got disqualified for failing to meet some requirements. Doyo lamented how past administrations seemed to have “blocked” their chances at being properly compensated. “Buti ngayon, walang humaharang (The current administration is not getting in the way]),” she said. Doyo said there had been suggestions that the money from the settlement be turned over to the national treasury since it was the government’s money that the Marcoses supposedly stole. But Doyo was opposed to the idea, insisting it is better for the human rights victims themselves to decide where and how to use the money, rather than run the risk of the money getting in the hands of corrupt officials. 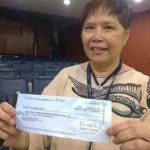 “At least hindi mapupunta sa kamay ng iba, kasi kapag sa amin iikot sa ekonomiya ang pera (At least with us, the money will be spent wisely),” she said. And that is exactly what 62-year-old Rodolfo Benosa would be doing to his P43,200 —buy construction materials for the repair of his humble abode in Baesa, Quezon City. Benosa was a factory worker for Sensory Container Corp when he and two dozens of other blue-collar workers in his neighborhood were arrested by authorities in the wee hours of February 25, 1982 for alleged subversion. The men were taken to Camp Crame, still in Quezon City, where Benosa said he was tortured for more than a week. “Binugbog ako. Hindi ako pinatulog. Pinahiga ako sa aircon nang nakahubad at sinako ako (I was beaten up. I was not allowed to sleep. I was made to lie naked on an airconditioner. I was placed inside a sack),” he told GMA News Online. After being provided with lawyers, Benosa was later transferred to Bicutan where he would spend three more years in jail. “Natuwa kami at nakatanggap kami. At least, napatunayan namin na may human rights violations ang mga Marcos dati (We are glad for this. At least we were able to prove that the Marcoses committed human rights violations),” he said. He said he considers himself lucky for even living to see their case against the Marcoses prosper and reap its benefits. “Iyong iba kong kasama, namatay na lang nang hindi inabutan ito. Karamihan dahil sa katandaan at atake (Other claimants I know had already died without being compensated at all. Most died of old age or due to heart attack),” he said. Like Doyo, Benosa thought the money they got was too small. He said it was not even enough to have his cataract, which has already damaged his right eye, treated. Benosa said he would just put the money to some other use like having his house repaired. “At least kahit mga apo ko man lang makinabang kapag maayos na ang bahay namin (At least even my grandchildren can benefit from this),” said the grandfather of nine.